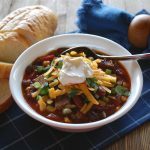 If you happen to have leftover smoked brisket, you'll want to make this AWESOME chili! In a large pot, over medium heat sauté bacon until crispy. Add the onions to the pot, cook until soft, about 5 minutes. Add bell pepper and garlic; cook an additional minute to soften. Add the leftover cubed brisket, chili powder, cumin, smoked paprika, and adobo sauce; cook 1 minute stirring constantly. Add the beer and allow it to deglaze the pan and cook off the alcohol, about 1-2 minutes. Then add coffee, diced tomatoes, tomato sauce, beans, corn, and green chiles. Bring the chili to a low simmer, cover, and cook for 30 minutes to an hour. The longer it cooks the more concentrated the flavors become. If the chili starts to get too thick, you can add water ½ cup at a time to thin it out. 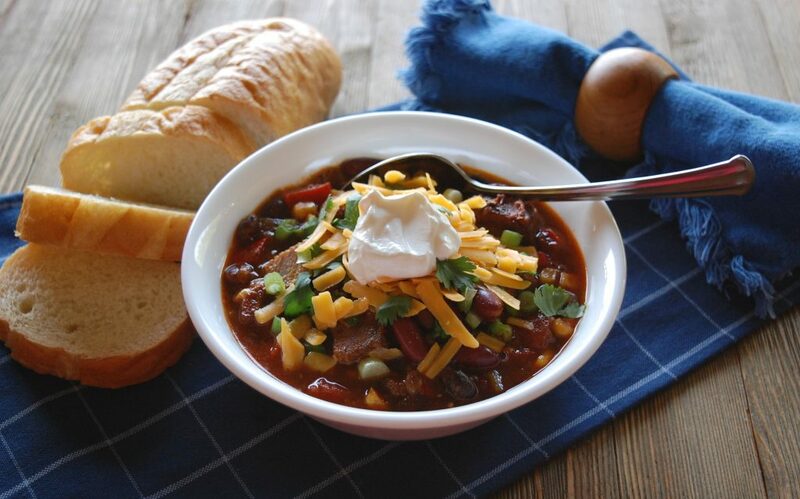 Ladle chili into bowls, top with cilantro, green onions, Cheddar cheese, and a dollop of sour cream, Enjoy!